PS Corcha Dhuibhne and St Brendan’s Killarney could not be separated this afternoon. Ruaidhri Ó Beaglaoich hit the levelling point today in Fitzgerald Stadium. 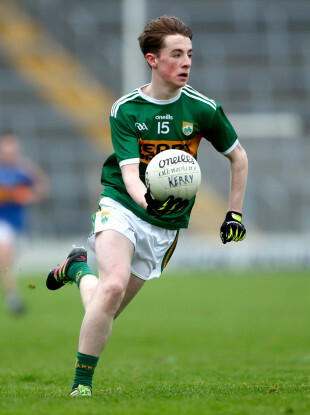 ANOTHER DAY WILL be needed to decide the Corn Uí Mhuirí winners in Munster as St Brendan’s College or Pobalscoil Chorca Dhuibhne could not be separated after 60 tight and tactical 60 minutes in Fitzgerald Stadium this afternoon. Pobalscoil were better defensively but the Sem will rue multiple missed opportunities on the day. Although it was a low scoring first-half, Pobalscoil Corcha Dhuibhne put in a massive defensive performance in the first period, frustrating the Sem forwards on many occasions and forcing them into some poor wides, six in the first period. In the 25th minute Pobalscoil defender Seamus Ó Loingsigh pulled off a big block on Sem forward Ryan O’Grady with a goal seemingly on as a free from Pobalscoil goalkeeper Deividas Uosis beforehand ensured that the West Kerry school would lead by 0-5 to 0-2 at the break. Eamon Fitzmaurice and Tommy Griffin’s side looked to have had the benefit of previous games at the venue as their lead was 0-4 to 0-1 after 17 minutes. They still led by 0-8 to 0-6 ten minutes after the restart until the Sem went ahead for the first time in the 41st minute when despite Uosis saving substitute Darragh Donohoe’s initial effort, Emmet O’Shea powered in a rebound before both sides traded the lead. Paul O’Shea put the Sem 1-9 to 0-11 in front in the 53rd minute before Ruaidhrí Ó Beaglaoich levelled the game two minutes later. Both sides had chances for the winner, but neither could find it as the match finished level and the first replay in the decider since 2015 will take place next weekend. Scorers for Pobalscoil Chorca Dhuibhne: Dylan Ó Géibheannaigh 0-4 (0-2f), Stiofan Ó Conchúir, Cathal Ó Beaglaoich and Ruaidhrí Ó Beaglaoich 0-2 each, Deividas Uosis (0-1f), Sean Óg Ó Moráin 0-1 each. Scorers for St Brendan’s: Emmet O’Shea 1-4 (0-1f), Paul O’Shea, Patrick D’Arcy 0-2 each, Michael Lenihan 0-1. Email “Beaglaoich rescues draw for champions as all-Kerry final in Munster set for replay”. Feedback on “Beaglaoich rescues draw for champions as all-Kerry final in Munster set for replay”.